M T D N o v e m b e r 2 0 1 8 88 F o c u s O n I n d u s t r y T elle Tire & Auto S er v ice Inc. has acquired two more stores and crossed a major goal off its list — expand beyond the St. Louis metro market. In June the company, led by fourth-generation tire dealer Aaron Telle, acquired Midtown Tire and Auto Service in St. Louis, and on Oct. 1 Telle Tire closed the deal to purchase Kwik Kar & Lube in Jefferson City, Mo., the state capital, located two hours west of St. Louis. The acquisitions are the second and third deals completed in 2018 — the company acquired Shamel Auto & Tire in January. Telle Tire now has nine locations. Telle, CEO and president, says the Midtown Tire acquisition is similar to previous deals the company has completed. Midtown Tire offered tires as well as automotive services. e store has been rebranded as Telle Tire and has undergone a $75,000 renovation. e interior space previously had been divided into two rooms. e dividing wall was removed, as was the drop ceiling, and the entire space was remodeled. "What we're trying to do with these spaces is we're trying to create a positive and exceptional customer experience," Telle says. at same thought went into the company's rebranding a year ago. "When (customers) are sitting there waiting, I don't want them to feel like they're in a tire store." Telle Tire showrooms are filled with modern furniture and offer amenities such as refrigerators full of free water and so drinks, bowls of fresh fruit, freshly made cookies, plus wireless work stations. "We're trying to be unique and do something different. When people walk in, they get a kick out of that. It removes another barrier for when people walk into a tire store. It helps them put their guard down." e company also offers a free shuttle, free loaner cars and a valet service for $20. HELLO JEFFERSON CITY e Kwik Kar & Lube acquisition presents more than just a location challenge. 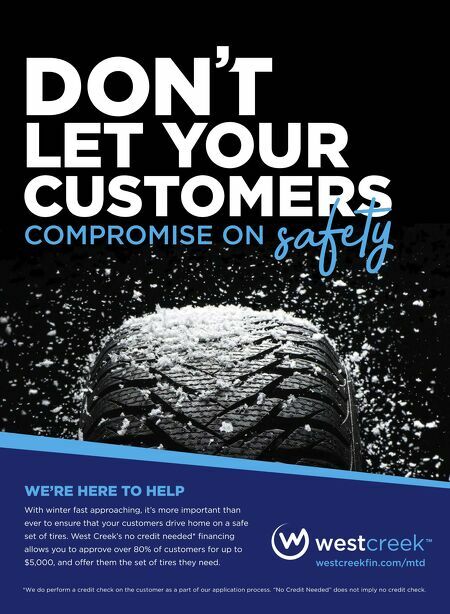 Unlike any of the previous stores Telle Tire has acquired, Kwik Kar has never offered tires or tire services. e facility in Jefferson City has eight bays and an enthu- siastic team. (e Kwik Kar franchisee in Jefferson City operated just one location with automotive services; Telle says the owner's other locations focus on the Kwik Kar Wash business model.) "is is something we've been looking at as a company, to expand out of the St. Louis market. It's been part of our business plan," Telle says. "I think the timing was right. We're starting to build out our management team where we could take on something like this. "One of the things that has us excited are the people who are working there. ere's a lot of longevity. ey're young and excited about the opportunities and to learn about the tire industry." Telle says he and Mike Allen, a Telle Tire general manager who is in charge of acquisition transitions, will spend the next 60 days in Jefferson City. e company has invested $50,000 in equipment from Hunter Engineering Co., and once it's installed Hunter will offer in-store training to the new Telle Tire team. Aer that, the Jefferson City employees will go to Hunter's headquarters in the St. Louis suburb of Bridgeton, Mo., for more training. e tire dealer has its tire manufacturer partners lined up to offer product training as well. "The next 60 days there will be a lot of additional hours being put in," Telle says. "We're fortunate some of the guys (on staff ) have worked in a tire environment before, so they're not necessarily brand new." e equipment installation and training will occur as the store remains open for business. Telle says it will be a slow roll out. In 30 days he expects the store will begin offering some tire work, though It won't be advertised. It will be offered to customers when technicians spot a set of worn tires or another tire issue. "ey'll get the deal of a lifetime on tires so we can build that trust and help them see we'll be a future source" of tire service. "We recognize we have one chance to get this right. It's important for us before we roll this out and market it that our team is educated and informed and equipped to handle these additional services," Telle says. ■ Telle Tire makes a move outside St. Louis NEW STORE PRESENTS LOCATION AND TRAINING CHALLENGES Joy Kopcha By As Telle Tire continues to grow, it's also investing in its brand. CEO and President Aaron Telle wants locations like this one in Richmond Heights, Mo., to look more like a furniture store than a tire store.